For the month of December I can say for the first time ever... Mondays are my favorite! I decided to cash in on some saved vacation days. So this month, I have Mondays off & the full week of Christmas! Pretty snazzy, huh? I'm taking full advantage of my Mondays by doing things I always wish I'm doing while stuck to an office chair. The first and foremost of those things is early morning baking. I want nothing more than to wake up every morning and start my work day baking for others. And that's just what I did. I was in my kitchen my 8am in my pjs & bunny slippers. It put me in the best mood. Then that led to an awesome day of eating, thrifting, more eating & drinking. We started with a trip to Biscuits and Groovy. Delicious biscuits smothered in gravy. Enough said. If you've been doing your healthy thing all week, reward yourself with a trip to biscuits & groovy. If you've been feeling guilty all week because you wish you'd made healthier food choices, eat your feelings away at biscuits & groovy. If you're neither of these...who cares...just go try biscuits & groovy if you haven't already. Every calorie is worth every bite. Billy ordered the regular Biscuits + Groovy. I ordered the vegan version of The Village Biscuits which was gravy, "sausage", "cheese", jalapenos, & chives. I also added tofu scramble. Afterwards, I unbuttoned my top jean button and happily prepared for the rest of the day. I've been wanting to checkout the North Loop District. I can't wait to go back! I'm in love with Room Service Vintage! I definitely spent the most time in that store. They have such an awesome collection of all kinds of stuff. Wall decor, clothes, jewelry, furniture, kitchen stuff, and other nick-nacs. And their pieces are not overly priced like some thirft stores. Between Room Service Vintage and Savers (just right around the corner on Burnet), I found some nice stuff for the walls, 3 tops, some other cool things for the house, and... a new bike! I'm pretty happy with how successful my first Monday off went. I'm excited for my next three day weekend coming up. So here is what I made this past Monday morning. 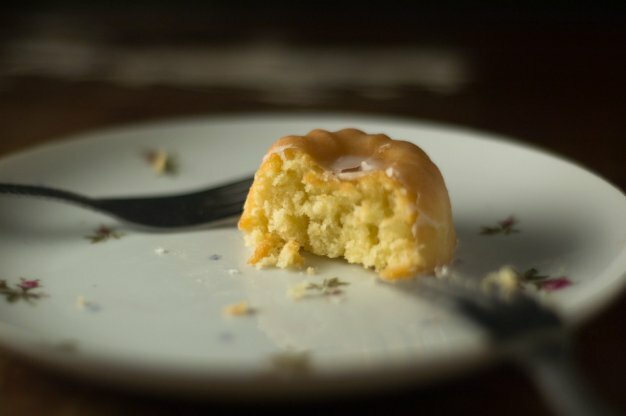 Mini pound cakes dipped in a thin rum lime glaze. I've never tried adapting from any of Paula Deen's recipes. These little things still contain the things we love and hate. Sugar. Fat. Calories. I'm not in any way saying I made it healthy or healthier. But my word...this woman wanted me to add 3 cups of sugar to this cake! Damn Paula! You do not play around in the kitchen. I just couldn't do that since I've never added that much sugar to any cake recipe. To be honest... I could probably try reducing the sugar to just 1 cup instead of the 1 3/4 cup I used. Next time. 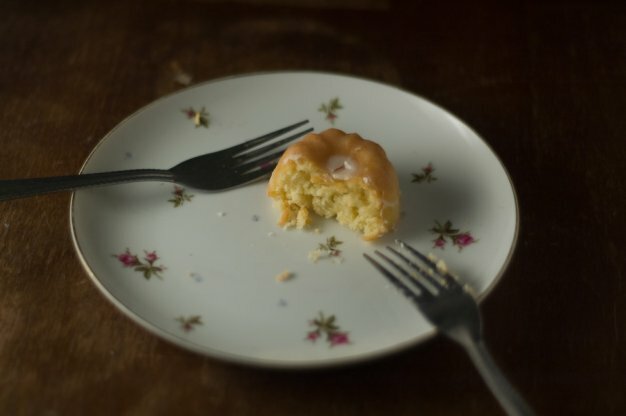 Now these little cakes may look sweet & dainty, but they're pound cakes. They've got some weight to em'! Preheat oven to 350. Prepare a mini bundt pan (or whichever pan you're planning to use). Sift the flour, salt, and baking powder together. Set aside. Cream the butter & yogurt in a large bowl. Slowly stir in the sugar. Beat in eggs, one at a time. Then alternate adding your flour mixture and milk, beginning and ending with flour. Mix in vanilla. Bake for 22-25 minutes. I mixed 1 cup of confectioners sugar with 3 tbsp of lime juice, 1 tbsp of sailor jerry rum, and 1 tbsp of water. When it comes to making a glaze, I tend to taste as I go. Add water to thin out the glaze if I need to. Yeah I know... I'm super professional.